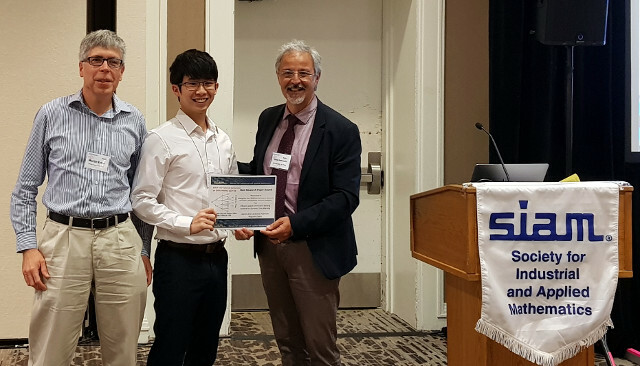 2018: Best Research Paper awarded by the Society for Industrial and Applied Math (SIAM) International Conference on Data Mining. 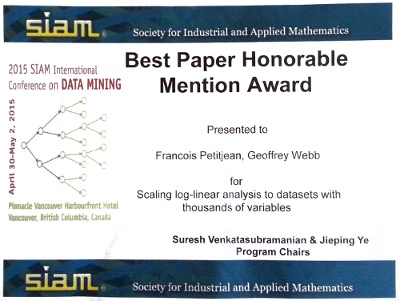 2015: Best Research Paper Honorable Mention awarded by the Society for Industrial and Applied Math (SIAM) International Conference on Data Mining. 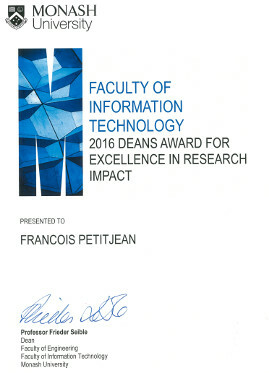 The SDM 2015 Awards Committee selected 4 papers from around 400. 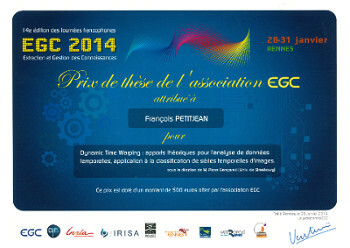 2014: Best Machine Learning PhD awarded by the French-speaking Machine Learning association “Extraction et Gestion des Connaissances” as the top PhD in Machine Learning for the period 2010-2013. 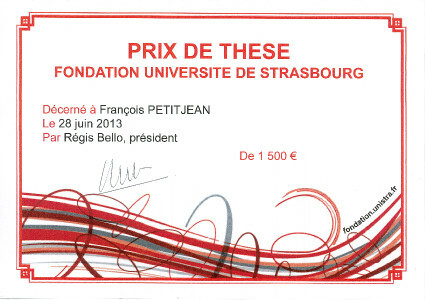 2013: Top Science PhD 2013 awarded by the University of Strasbourg for the best PhD of the year in Science. The University of Strasbourg typically graduates 400 PhDs per year. 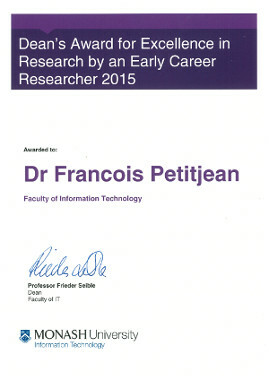 Google Scholar has this on me. ECML/PKDD: J. Capdevila, J. Cerquides, J. Torres, F. Petitjean and W. Buntine, “ A Left-to-right Algorithm for Likelihood Estimation in Gamma-Poisson Factor Analysis,” in press. Behaviormetrika: Joan Capdevila, He Zhao, F. Petitjean and W. Buntine, “ Experiments with learning graphical models on text, ” in press. PAKDD: N. Zaidi, F. Petitjean and G. Webb, “Pre-conditioning an Artificial Neural Network using Naive Bayes,” 2016. 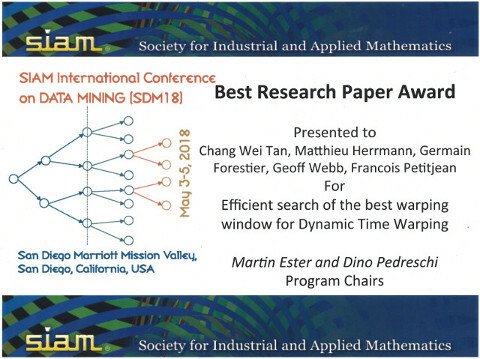 Knowledge and Information Systems: F. Petitjean, G. Forestier, G. Webb, A. Nicholson, Y. Chen and E. Keogh, “Faster and more accurate classification of time series by exploiting a novel dynamic time warping averaging algorithm,” in press. SIAM SDM: F. Petitjean and G. Webb, “Scaling log-linear analysis to datasets with thousands of variables. ” Best Paper Honorable Mention. 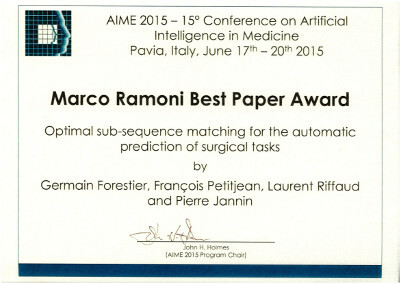 AIME: G. Forestier, F. Petitjean, L. Riffaud & P. Jannin, “Optimal sub-sequence matching for the automatic prediction of surgical tasks.” Best Paper Award. Artificial Intelligence in Medicine: G. Forestier, F. Petitjean, L. Riffaud & P. Jannin, “Non-linear temporal scaling of surgical processes,” 2014.
from Steiner Sequence to Compact Multiple Alignment,” 2012. 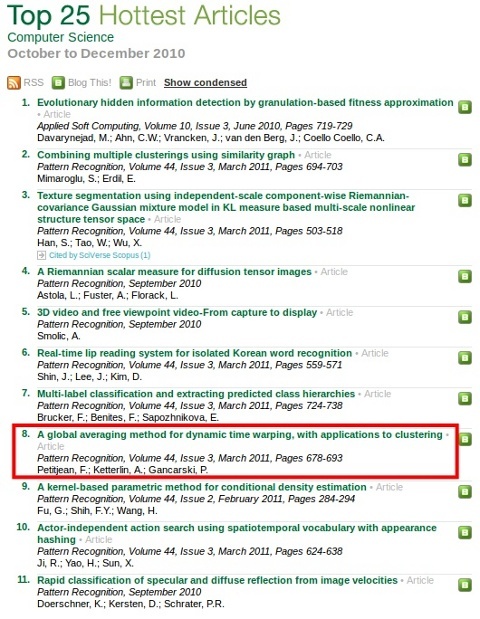 Pattern Recognition: F. Petitjean, A. Ketterlin & P. Gançarski, “A global averaging method for dynamic time warping, with applications to clustering.” Ranked 8th hottest article in Elsevier's Computer Science journals.